If you have a In the Night Garden fan, they are likely to love In the Night Garden Live. 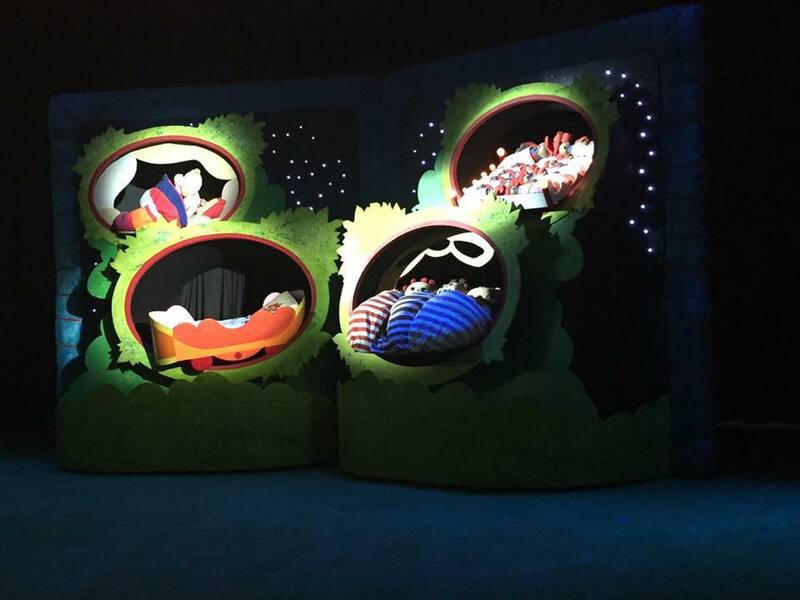 In the Night Garden Live is a stage production featuring all the main characters from In the Night Garden. The show is held in a special inflatable showdome which kind of made me think of inflated parts of a snowman…or even the Michelin man! …an amazing musical theatre experience for all the family. 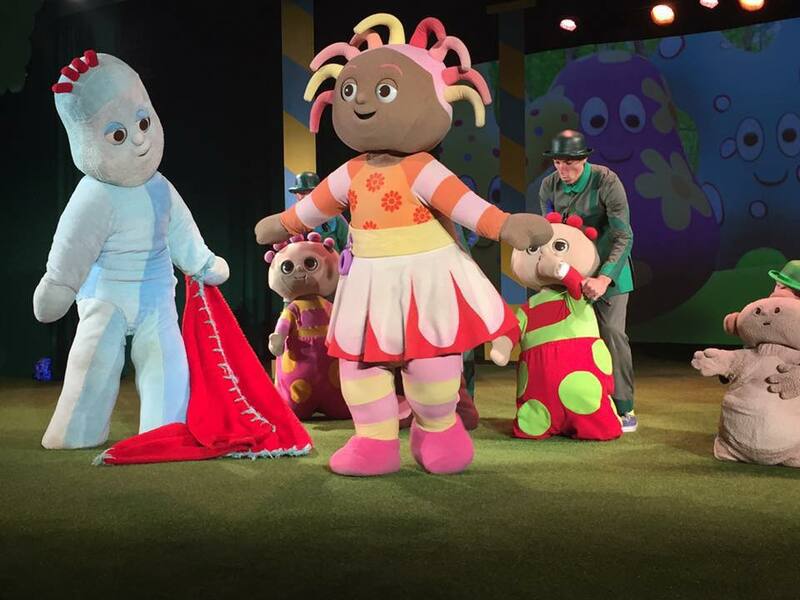 Children’s favourite CBeebies’ stars – Igglepiggle, Upsy Daisy, Makka Pakka and friends – are all brought beautifully to life on stage using full-size costumes, magical puppets, enchanting music and breathtaking projections. Igglepiggle loses his blanket and all his friends help him find it. Makka Pakka washes everyone’s faces, until his sponge gets stuck in Upsy Daisy’s megaphone! Last year we took Bee to see the Pinky Ponk show and when In the Night Garden Live offered us the chance to see a show again this year we of course picked the Ninky Nonk Show. All the characters are in both shows so you simply need to pick which one you want to watch…or watch both! You have the choice of premium and standard seating. Premium means you get to sit in the first 5 rows. Is it worth the extra price? Last year I purchased the premium seats and sat in the second row. We were closer to the characters on stage but to be honest, even sitting in the standard seats this time, we got a pretty good view. The seats are pretty much large steps (carpeted) and towards the end of the show can start to feel a bit uncomfortable. Seats are not allocated in advance. So if you do go for standard tickets then it is best to get there early if you want to be closer to the stage rather than at the back. But with only about 13 rows even the back doesn’t seem a huge distance away. 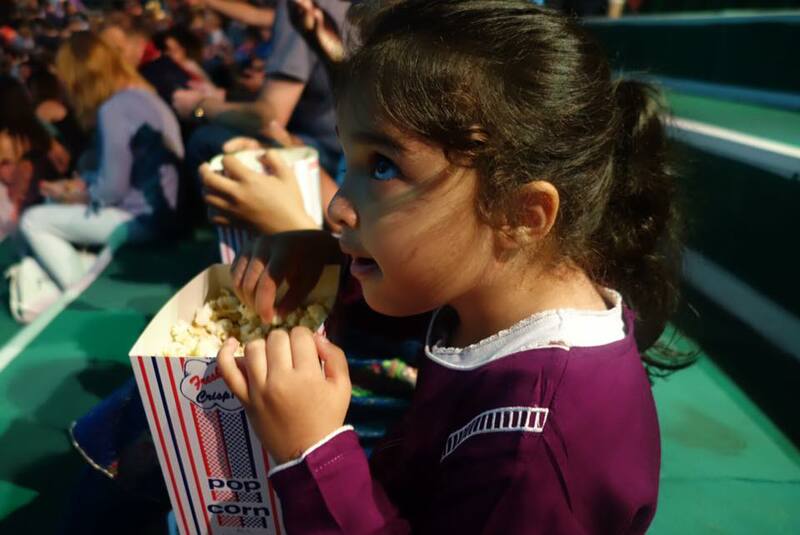 The show lasts just under an hour which is ideal for the little ones. You could sense some of them getting a bit restless towards the end. The showdome did this time feel a bit stuffy and by the end of the show we were glad to get out into the cooler part. The show itself is a mixture of puppets being controlled by people dressed in green outfits, and full size characters. The Ninky Nonk made an appearance a couple of times on the stage but the Pinky Ponk and the Hoo Haa’s along with the birds were projected onto the wall of the showdome. Prices can vary and are cheaper the earlier you book. And there are often discounts available at the start when the tickets are released…so this could then give you a good price. Weekend shows also can be a bit more pricey…with premium tickets at £30 (standard £17.50). The cheapest I have noticed is £12.50 for a standard seat for the final evening performance on some days. Baby’s under 6 months are charged £1 and both children and adult tickets are priced the same. If you want to do a meet and greet with Upsy Daisy or Iggle Piggle then that will cost an extra £15 (£30 if you want to see both). You also have the option to purchase a goody bag that contains £64 worth of products, this will cost £29 if booked and paid for in advance…or £39 on the day. We did purchase the goody bag last year and Bee loved it. However if you do not want all the items, they are available to purchase individually. If you decide to purchase all the items then clearly it can end up costing quite substantially for an hours entertainment. 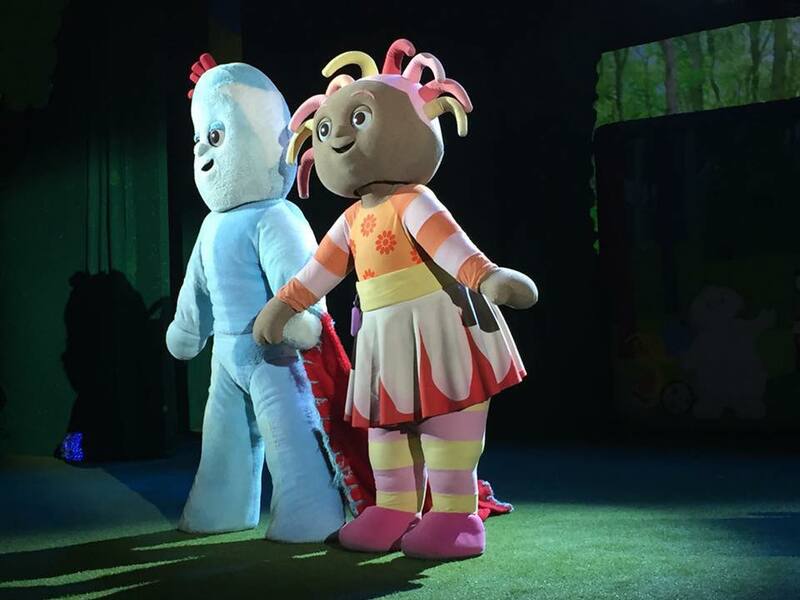 However it is a unique experience for the little ones and you could clearly see and hear the excitement as the characters came out on to the stage, in particular Upsy Daisy! The kids were also in awe of seeing the projections on the wall of the showdome. It is still not to late to see the show. In the Night Garden Live is in Birmingham until 30th July before moving on to Manchester from 5th August to 28 August 2017. 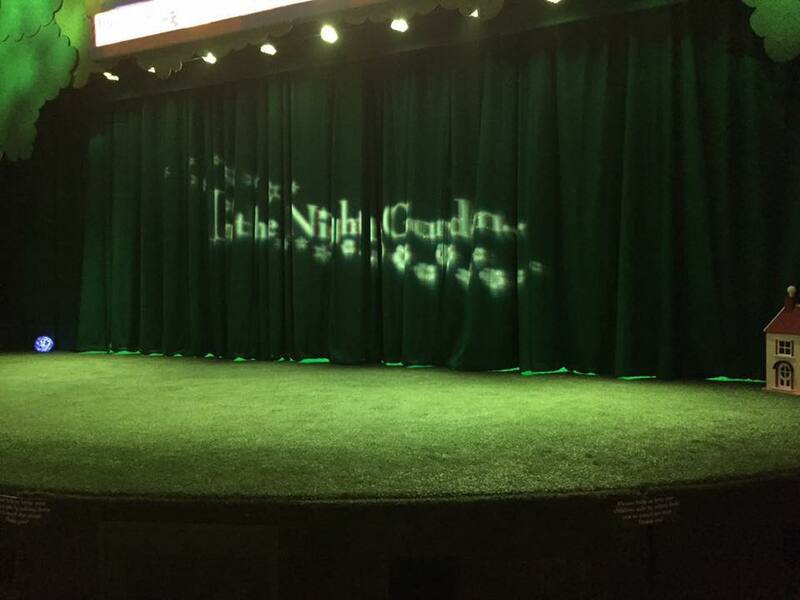 You can get more information and purchase tickets from their website: In the Night Garden Live. Disclosure: We were sent tickets for the purposes of review. All thoughts and opinions are our own. Photos used in blog post were taken in the 2016 show. Wow…what a fun….i love puppet show….and these look so adorable…. We went to watch it in 2015 and we enjoyed it. We even got last minute tickets the day after and went again. I don’t think it’s worth paying for premium tickets, as when we went the next day we were on the back row and could still see fine. I’m not a fan of things like this BUT I have to resign my self to the fact that I’m a mummy now and these things have to become real life for me at some point lol! I’m sure my little ones would love it and get all excited when they get old enough to realise what’s going on. Wow looks so cute! I bet your daughter loved it! This looks really cute! however, I’m curious… did you find the puppeteers being on-stage distracting/detracting from the fantasy of the show? I personally did as ended up watching them to see what they were doing!! But I don’t think it bothered the kids much. I think my son would enjoy this but just wondering if this show is set in other cities as well. Birmingham is around 4-5 hours by drive from my place so will have to plan a 2 day trip to attend this show. I did say at the bottom of the post that they are moving on to Manchester next. Prior to that they were in London. Looks like loads of fun for kids! Especially with “In The Night Garden” craze among kids. Thanks for sharing! I’m not going to lie, I think even I would get excited about this show! I’ve always wanted to take my son. I am definitely considering it now! I think I have a 4 year old not too far from me that would LOVE this! ma’shallah I’m sure your daughter loved it.